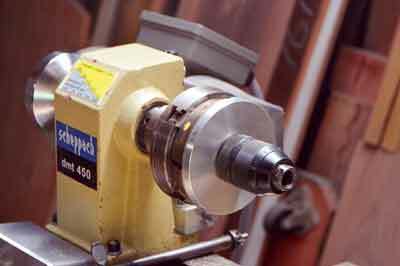 One of the most useful methods of holding small items and tools in the lathe is to use a Jacobs-style drill chuck in the headstock. So why do I hear and read that this shouldn't be done? Well, if you put any side pressure on a Morse taper it can come loose, and vibration or chatter can shake it loose almost instantly! Morse taper tools are best suited to drilling where the pressure goes directly up the drill, through the chuck and along the length of the taper. 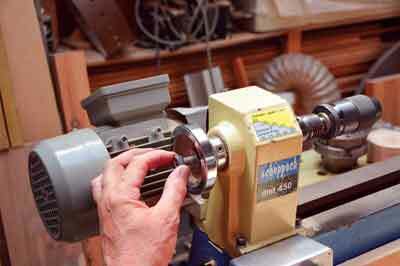 On the lathe we are tempted to hold sanding arbors, polishing mops and the like with a Morse taper drill chuck in the headstock because of the conveniently placed Morse taper socket in most spindle noses. Here we put side pressure on the combination that it wasn't really designed for. So how do I use a drill chuck in the headstock safely, without it coming loose? 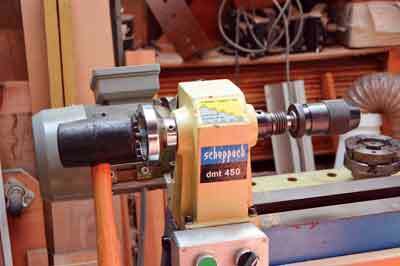 I use a drill chuck with a threaded hole in the end of the Morse taper; this enables me to use a drawbar to secure it. A drawbar is simply a threaded bar - a piece of studding will do nicely for this purpose - that threads into the Morse taper arbor on the drill chuck and passes through your headstock. 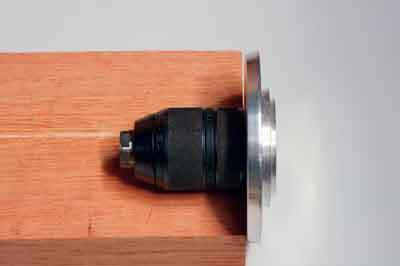 It is held in place by a nut and washer and this keeps the drill chuck from potentially working loose. 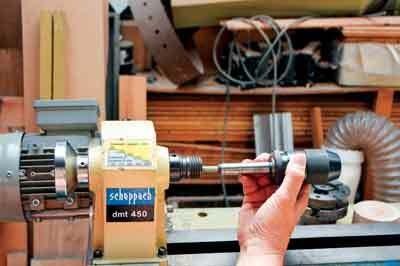 It also helps when you want to release the drill chuck from the lathe, as all you have to do is loosen the nut and give the bar a tap, then you can unscrew the drawbar and remove the chuck safely and securely. 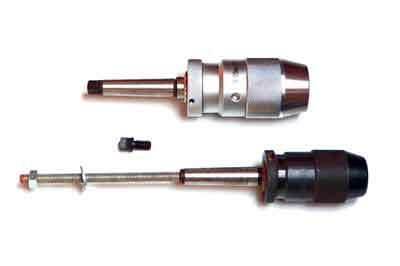 When using any Morse taper tooling ensure that both the taper and socket are clean and free from sawdust or chips. Do not overtighten a drawbar as it just makes it harder to remove afterwards. So that I can also use the same drill chuck in my tailstock, and making use of the auto-eject feature built into it, I have a screw-in tang that replaces the drawbar and turns the arbor into the more familiar one with a tang. I am using - illustrated in the photos below. This is much faster and more convenient to use, although theoretically not quite as accurate as using the Morse taper. I have made this faceplate with dovetails to fit in three of my favourite chuck jaws.